Monochrome FashINDECISION – Which Hue Are You? Bright colors are IN this Fall and in our Monochrome Challenge we’re already seeing players picking bold hues for their closets. For our FashINDECISION, we can’t decide between these blue or yellow looks. Which color would you choose to make a fashion statement this week? Ready to rock some color? Head to www.BattleShop.co and throw as many shades as you can in your closet this week. Having the best closet could win you an AMEX gift card! Burberry Brit Allover-Check Tee – $195.00 Saks Fifth Ave.
No one wants to be squeezed into a pair of tight jeans while they’re cruising the coast? Lucky for us, Intermix is giving us a whole new reason to hit the road this Summer with these Rag & Bone digitally printed Sheffield denim sweatpants! We found these “cotton con artists” while BattleShopping and they look exactly like a pair of jeans but fit and feel like a pair of sweats! They’re definitely finding a home away from home in our Road Trippin’ closet this week at BattleShop.co, we just can’t decide if we want to dress them up with this Beyond Vintage lace top from Scoop NYC or down with this Haute Hippie graphic pocket tee from Saks! Help us out! Visit BattleShop.co to design your own Road Trippin’ themed closet today so you can compete for an AMEX gift card! Haute Hippie Graphic pocket tee – $105 Saks Fifth Ave.
We’re filling our BattleShop closet with stuff we’d bring on a weekend at the Cape or maybe an overnight sail, but we’re stuck! 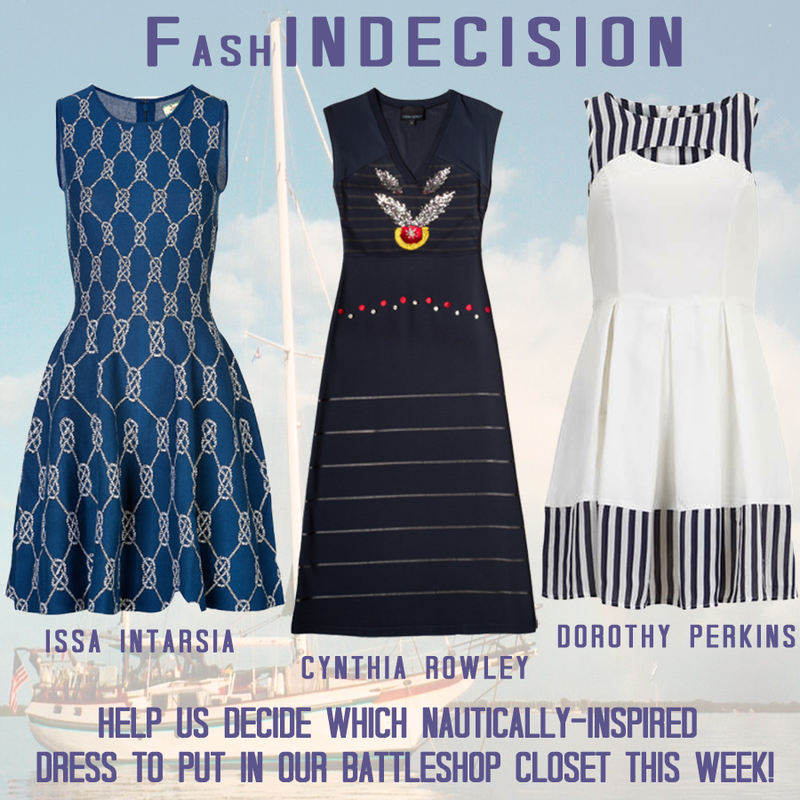 We can’t decide which of these great nautical-inspired dresses to choose. Would you go with the Issa Intarsia dress on the left, the Cynthia Rowley dress in the middle or the Madam Rage dress from Dorothy Perkins on the right? Help us out! Start building your own BattleShop closet today for a chance to win an AMEX gift card. It’s the last day of a long weekend and the party’s almost over, but not just yet! We’re spending the day on a sun-soaked beach and can’t decide which jean skirt to pair with this adorable Chloé Polka-dot cropped cami. Help us out and let us know which look you’d go with! We paired our Citizens of Humanity Daria skirt with Tom Ford Islay sunglasses from Saks Fifth Ave. ($390) and Kate Spade Ardes slide sandals ($158). We paired our Philipp Plein studded skirt with Tom Ford Henry horn-rimmed sunglasses from Saks Fifth Ave. ($395) and Nine West Peanut gladiator sandals ($39.99). Let us know which look you’d wear! We’re having another FashINDECISION! This Mara Hoffman cover up from MatchesFashion is a no-brainer but we can’t decide which gorgeous bikini to pair with it. Help us out! Help! We’re on our way to celebrate Dad at brunch and we didn’t realize how chilly it was in NYC! We are wearing this adorable TAYLOR dress from Lord & Taylor but we need to stop back in and grab a light jacket. Help us decide which one to choose! Aldo’s Santeramo wedge. Love this look!